So here are the tricks I’ve come up with along the way that make the situation happier, easier, and more enjoyable. And for those that are new to having a traveling husband…I promise you, it does get easier (I know you think it won’t!). When your spouse is traveling and you find yourself alone, you need to listen to happy music all the time. And when I say all the time, I literally mean all the time. And it HAS to be happy. Whatever you do, under no circumstances should you be listening to Sarah McLaughlin or Enya. Music has such a huge effect on our moods that you have to take advantage of it! Nowadays, it’s so easy to find amazing playlists that will filter the songs for you, so take advantage of that! If you have an Echo (that is what I use), you can literally say to it “Alexa, play happy music” and it will come up with a corresponding playlist! When I hear songs that I really love, I add them to my own music library so that when I’m in the car or out with the stroller, I can keep playing happy tunes. This is another one that has been scientifically proven to make you happier. And why not treat yourself? Pick out something bright and beautiful and put it somewhere that you pass by often. You also don’t need to break the bank and splurge on dozens of out-of-season roses. Head to your local farmer’s market and buy in-season flowers or even potted flowers that will last way longer. I got a beautiful pot of flowers last week from the farmer’s market for $3 and as long as I water it, it should last me months. I know this seems counter intuitive. You’re probably thinking that one silver lining of your husband traveling is that you don’t need to keep the house clean. Unfortunately, this factor has just too big of an effect on your mental state. Regardless of what you think or tell yourself, a clean house will make you feel better and a messy house will stress you out. You can, however, sing to your heart’s delight and wear your Christmas flannels while you’re cleaning. After many iterations of weekly travel, my husband and I finally discovered that my weeks were significantly easier if I was able to start the week off with a super clean house (I know…duh). It may seem obvious, but it’s hard to prioritize cleaning when the weekend is your only family time. But it will make a huge difference! For a while, I was spending so much time in the beginning of the week cleaning up after our weekends that I was starting to feel a bit resentful. And that is a recipe for disaster if you’ve got a traveling husband. If you get it all done Sunday night, you won’t have to stress as much if your time all of a sudden needs to shift to something more urgent. And more importantly, you get to start your week off happy…and nothing’s more important than that! I know this seems obvious, but you’ll be surprised how badly you just want to curl up and turn on a marathon of Law and Order SVU. Normally it may not affect you, but with your partner gone, all of a sudden your thoughts can get the better of you. And it’s bound to be the day that the SVU episode profiles a mother alone in her home who is attacked or her children kidnapped. Just don’t do it. Instead, find a marathon of Modern Family, Seinfeld, or Friends. I’m a total documentary-addict, so my favorite thing to watch is a good documentary. Even harder to avoid or filter will be the news. If you’re used to watching the news every morning or night, but be really careful which programs you choose. The local news around these parts is depressing beyond belief. In the mornings, the Today Show or Good Morning America are much safer. I sometimes even turn to CNBC for stock market talk…they’ll catch you up on the important news highlights anyways. The same rule that governs what you watch on TV also applies to what you read. I’m sorry, but this is not the time for a Steven King novel. In fact, it may not even be the time for a cheesy romance. If possible, try to fuel your love for nonfiction (or create one if you’ve yet to dive into the world of nonfiction!). 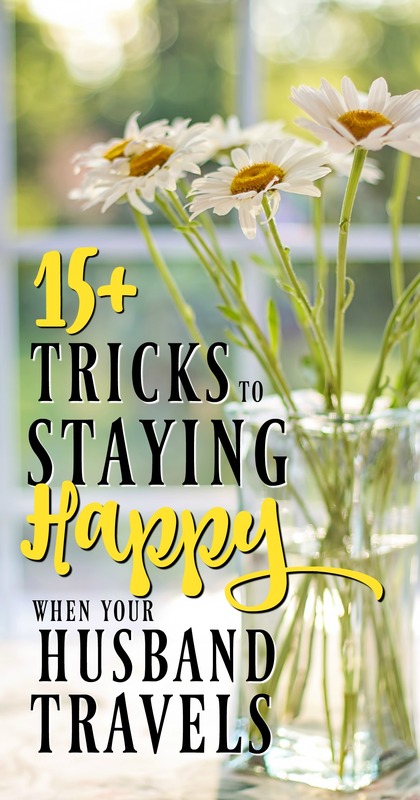 There’s an endless list of nonfiction books out there whose sole purpose is to make you happier. I’m not kidding. Remember Fido? Your furry friend that you used to spend time with before you had kids? Well time to rekindle the relationship. Again, here is another scientifically proven way to boost your mood and release some endorphins. Petting your dog or cat will not only lower your blood pressure, but it’s a great distraction to get your mind off things. Even if you just go for a 10 minute walk, it will make a huge difference. And if you’ve got kids, then it’s a great way to get them to blow off some steam anyways. My son isn’t always up for really long walks, so I try to take at least 3 short walks a day. Even when I don’t want to, I make myself go out and I’m always amazed by how good it feels. It’s like working out…sometimes the hardest part is just making yourself do it. Again, it’s easy to fall into the trap of thinking that you’re off the hook from your normal routine. But it’s more important than ever to be organized so that life is easier for you. Planning meals is always a good idea, but it’s especially important to make sure they’re easy. So often, by the time I get a chance to eat dinner I’m exhausted…and so are my kids. Which means I have to prepare, eat, and clean up with one hand…while bouncing…and singing. Take advantage of leftovers, cereal, frozen meals, and fruit. Remember – if you can’t make it with one hand while bouncing and distracted, it’s too complicated. This one is especially hard during the winter months because it can be a hassle to load up my preschooler and baby just to go somewhere and return before the next nap. But it is so important to get out of your house, encounter other humans (especially the adult kind! ), and find some needed distractions. I also found it useful to plan trips that we plan to take together when he isn’t working. It can be a greast way to pass the time. For example, I’ve been looking at Krakow recently. In fact, today I was trying to find top day trips from Krakow to the area around the city. Little things like this can really help to occupy your mind. When your husband is traveling, it’s time to focus on you for a bit! So start a new project that you’ve been thinking about for a while. Find some cool crafts, new recipes to try, or a hobby you’ve been thinking about for a while. It’s a great way to not only be distracted, but also feel like the time is special, not just something to tolerate. When my husband is gone, I spend way more time working on my blog than usual. Which, for me, is amazing! It not only feels like personal time, but as it grows and earns money, I feel more like I’m contributing to our finances (and maybe soon he won’t need to travel 😉 ). I am a HUGE fan of daily affirmations and now use them almost everyday. I got turned onto them by reading The Miracle Morning (that was one of the books I suggested – if you haven’t read it yet, you’re totally missing out!) and let me tell you, they are truly life changing. To make daily affirmations work, you need to come up with affirming statements to say to yourself every morning, noon, and night (or whenever works for you). These statements are things you want to be, feel, and see. They’re thoughts that will start to transform your reality. My marriage grows stronger each and everyday. I am beautiful, I am loved, I am admired. I am helping to create my family’s future. Something amazing is going to happen to me today. I know these can seem ridiculous at first, but I can not emphasize enough how powerful they really are. If you want more examples and a more detailed explanation of daily affirmations, check out this post ? How to Use Daily Affirmations to Transform Your Life. This is yet another brilliant concept taken from The Miracle Morning and it has just as much potential to change your mood as daily affirmations do. Vision boards have a simple purpose: they help you visualize your dream life. Looking at it is going to make you happy. It’s what they do! Visualizing your dream life (husband included, hopefully) will help you feel more like a team. The traveling is something you’re both doing for a greater purpose…achieving your dream! If you’re looking for a new project to take on (like we talked about above), this can be it! There are a lot of details that go into making a great vision board, so I won’t go through them all here. If you’re ready to make one though, head here for more details ? How to Create an Effective & Inspiring Vision Board. Night, without a doubt, is the worst. For some reason, once that sun starts to set the anxiety and loneliness will start to creep in. The best thing you can do is keep yourself busy so you don’t have time to let your mind wander. Try to plan something fun. Visit with friends or plan a special activity with your kids. The more tired out you can get them (and yourself), the better! The hardest nights for me are when I can’t get my kids to sleep, so anything I can do to make that transition easy is worth it. Getting exercise and staying active is another scientifically-backed method for keeping yourself happy. Not to mention that it’s another great way to focus on yourself for a bit. If you have young kids like I do, then get used to that stroller! Try and do sit-ups, push-ups, and squats while they’re napping or you’re watching TV. You will feel happier AND more beautiful! I know this sounds very environmentally irresponsible but it can make a huge difference, especially if nights become a little creepy (which they do). Leaving lights on outside the house is a huge safety precaution, so it should give you some peace of mind. Inside the house, I always leave the lights on that lead to the bathroom and one downstairs. It makes the house feel a little warmer and is a big comfort. 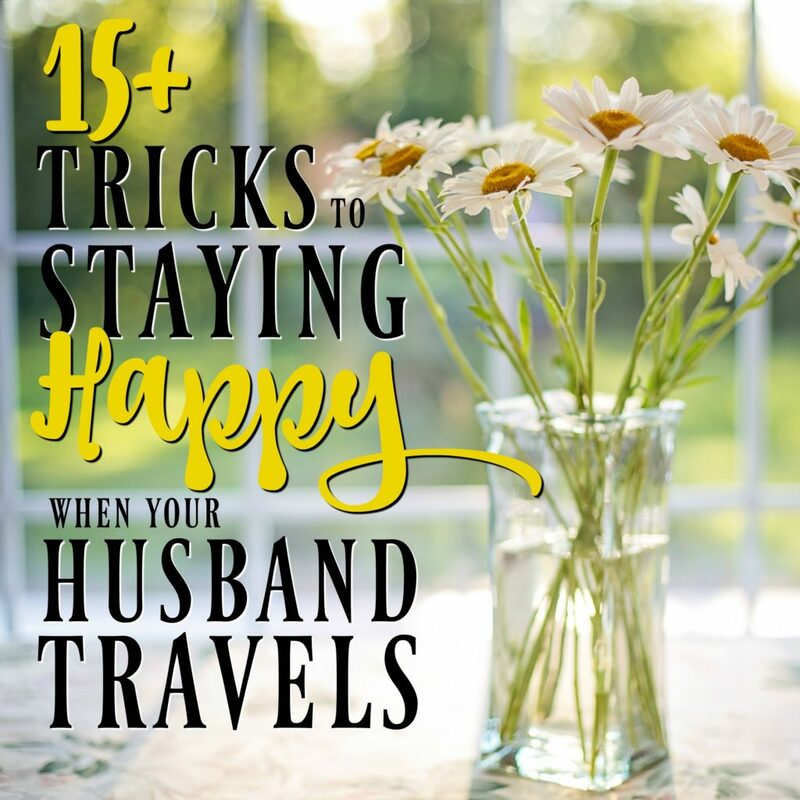 Ok, so let’s recap the tricks to staying happy when your husband travels: Music, flowers, pets, and fresh air are a must! Horror flicks and crime dramas are a no. KEEP BUSY. Go easy on yourself and try to have fun! I promise, it gets better. Before long, you may actually find yourself happy that he is traveling! Oh, and also…chocolate makes you happier and is packed with antioxidants. Science backs this. Just saying! Some great ideas here. I’m a big fan of technology to stay connected with my guy. I have been the spouse of a frequent business traveller for more than a decade and I am well acquainted with the pros and cons. Like why does stuff always break or some other kind of crisis happen when he’s away?! Oh this is a great list! My hubby travels too and I love that you turn the lights on at night too. I find it creepy when the house is too dark or too quiet too:) I’m horrible at cleaning though and it usually turns into a disaster, so I’ll have to remember that it’s better to make it tidy. Happy weekend! These are great tips! My husband is hardly ever out of town, and when he’s gone, I work like a maniac and get so much done. So that’s my silver lining–getting lots of stuff done. I have a few friends whose husbands travel every few weeks for work, and I can’t imagine how difficult that would be. Fortunately, my boyfriend only has to travel for work a couple times a year. We don’t live together, so at least I don’t have to worry about nights alone when he is gone. But I will definitely try some of these other tips the next time he is away. Thanks for sharing them with Hump Day Happenings! Well, I am still single and young so don’t know about some of the lonesome, but you could even take classes or work on some surprises. I’m with you on the lights being on – I feel so much better that way when I’m home without the hubby! Great advice. I think we should all do these thing on a regular basis even when our spouse is home! An extra bit of self care is in order. I’m lucky in that my husband only travels half a dozen times a year, but when he does I always try to make it a bonding experience between me & my daughter. She’s a Daddy’s girl, but our relationship is often rejuvenated during his absence, bringing us closer together. I see the strengthening of our bond after each trip. This is such great suggestions! My husband doesn’t travel, but he works long hours and it always helps to have ways to focus yourself and find productive ways to pass the time until he gets home. Thank you for posting this! I am spoiled in that my fiance only has to travel every few months, and only for a few days at a time. Still, I don’t handle it well! I’ve never lived alone, something I didn’t realize until he began traveling. I went from my parents’ house to a dorm room to an apartment with a roommate to my house with my fiance. I’ve never had to deal with the loneliness of being home alone for any period of time. I’m still getting used to it. Yes yes and yes!! These are all so true, and not just for traveling spouses. My husband works nights so I am up with our son in the morning while he sleeps in and then had to go to bed without him at night. It is so easy to get sucked into the mood killers but these are such great tips to combat that loneliness and sadness! These are great tips! I do pretty much everything on this list!! Music was a big thing for me. I recently discovered that listening to music changes my mood. Everything used to be background music, but then I started to feel better when I turned on some music and danced around the house with my toddler. Definitely helped! Thanks! Lol, that’s always a tough one for me because I feel the same way! My husband refuses to watch Grey’s Anatomy, but holy moly I can’t watch that alone…too many sad episodes have kept me up at night! Great post! My husband rarely travels but I know many women deal with this regularly. Thanks for the tips! Thanks for sharing! My husband happens to be away on a work trip right now! He doesn’t travel that often for work, but it’s still hard when he does. Great tips! There have been a few times that my husband has been away and I have found these tips to be really helpful. Thanks for the reminder! What a great idea for a truly oringal (and needed) post! I have two friends who deal with this a lot and I know how hard it is for them. When my husband was a medical resident he was gone all the time, often overnight, and I was a new mom who felt lost and scared. 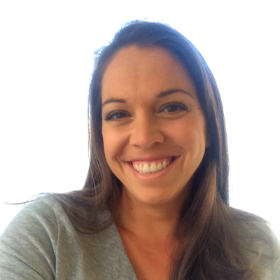 Thanks for reaching out to other moms! Great post idea and such great points. My partner was out of state for 3mos taking care of his ill father and I wish I would have had this list then. At first, you’re like “yay! I can watch whatever catches my eye and be a mess all day” and then just like you said, that breeds sadness and loneliness. The music is key! Thanks for sharing!